One week later, just as he promised, Michael and Son was at their door step. After diagnosing the heater, our technicians found that a fuse had caught fire. Ritchie was so grateful that the house did not catch fire as a result, but unfortunately, parts are no longer available for a unit of this age. A new system would cost about $5,000; “…only thing I could think of was we was going to freeze to death…” says Ritchie. That’s when Roddy Leiva, also with Michael and Son Services, went to management and said “Hey we have this family that needs help…” and “…they hesitated not one bit to say let’s get it done”, says Leiva. Because our motto is “If you can’t, we can!” installers Carlos and Emerson were ready to give Cynthia and Ritchie the comfort they were in need of. A new heat pump, a new air handler, and a new A-frame coil was now installed. Assuring that Cynthia and Ritchie would have one less worry; this season and the winter season ahead. This installation could not have come at a better time, as Cynthia battles with terminal cancer. Ritchie was so relieved, that now there is less of a risk of his mother getting sicker. If you’re in the DC, Maryland or Virginia area and looking for a reliable service company that you can trust to do any job around the house. Call Michael & Son Services today at 1-800-948-MIKE or visit our website. To learn more about Michael & Son Services Helping Hands Program visit us at michaelandsonhelpinghands.com. Also, like us on Facebook, follow us on Twitter and subscribe to our YouTube page to find out about upcoming events, special events and much more! If you have been following Helping Hands for any amount of time, you’ve probably noticed a pattern between health and the indoor air quality. For someone who suffers with a chronic illness, extreme temperatures are not just a matter of comfort, sometimes they can be a matter of life and death. It’s so crucial, in some households, the HVAC unit doubles as a life support system. For Caleb Loudermilk, it was a matter of life and death. Caleb was born with Lennox Gastaut Syndrome, a rare and severe form of epilepsy that left Caleb with the cognitive abilities of a 9 month old child. Suffering from up 100 seizures a day, caring for him was a full time job and left his mother, Amber Burton, unable to work. When the families A/C system broke down in the dead of a brutal southern Virginia summer, Caleb’s symptoms increased dramatically and he was hospitalized under intensive care for over a month. Because he could not be discharged from the hospital to a home without working A/C, Amber was desperate to have the unit repaired but could not afford the cost. She began to reach out for help and was told about the Michael and Son Cares Program. Shortly after contacting Michael & Son, Caleb’s home had a brand new HVAC system and he was able to return home. For all of us at Michael & Son who have worked with the Helping Hands Program, December 23rd is solemn day. Three years ago on that day, in the midst of all the holiday cheer, we lost someone who had a profound effect on all of us. Amanda Mahmood was a young, bright and inspirational young lady who suffered from congestive heart failure. We helped her with some home repairs and in return she inspired us to help more families and make a bigger impact. Three years later, and just a week after that anniversary of Amanda’s passing, a call comes across my desk from a single mother of a disabled child in Richmond, VA with a broken HVAC unit. Recently widowed Cari Browne and her daughter Savannah had been in the cold since Christmas morning and because Cari was providing 24 hour care for her daughter, she was unable to work and definitely couldn’t afford the cost of replacing her homes HVAC unit. Her daughter, Savannah, was born with a rare gene mutation that caused her to have heart failure as well. The cold temperature in her home was aggravating her condition and they were in desperate need of help. When I spoke with Cari and we talked about Savannah’s condition, I immediately thought of Amanda. It gave the request even more of a sense of urgency and I called Michael & Son CEO, Basim Mansour, who was traveling but gave the green light to have the work done immediately. Within just two days of contacting Michael & Son Services, we were at the Browne’s home installing a brand new HVAC system at no cost. Check out the news story for more details about the job. When Bobby Hicks returned from the wars in Afghanistan and Iraq he didn’t expect to have another battle to fight. A devastating diagnosis of Leukemia left Bobby and his family wondering what the future would hold or if he would have a future at all. Too add to the Hick’s family’s woes, their already problematic HVAC system and water heater gave out just as winter season was beginning. With no where left to turn, the family reached out to the Michael & Son Cares Program. “When the Hick’s family’s story was brought to my attention, I knew we had to help” said Basim Mansour, Proud Son & Owner of Michael & Son Services. “Here’s a guy who gave so much for his country and asked so little in return; I not only wanted to help them with their home repairs, I wanted to do something really special for Bobby. The Michael & Son Cares Program and Monumental Sports center had worked in conjunction to plan a special surprise day at a Washington Capitals game for Bobby and his family. When an extended stay at the hospital for intensive treatment foiled those plans, The Cares Program and Monumental Sports decided to bring the Washington Capitals to Bobby. When Bobby Hick’s woke up Sunday morning he didn’t think he would be meeting is idol and star defenseman for the Washington Capitals, Mike Green. Taking time from his busy schedule, Mike Green surprised Bobby at Fairfax Hospital with a signed jersey and skates. It was a moment Bobby and his family won’t soon forget. Not to far from the Hicks family lives the Schaidt’s and their daughter Jada. Born with complications to her cardiovascular system, Jada had undergone multiple surgeries and lived with a pacemaker since birth. When the families HVAC system stopped working, the family faced a dire situation. Because of Jada’s condition, maintaining a comfortable climate in the home was essential. Faced with financial difficulties due to other health issues within the family, Jada’s mother reached out to the Michael & Son Cares Program. Find out what happens next on Helping Hands, this Saturday at 7:00pm on NBC! Also like us on Facebook, follow us on Twitter and subscribe to our YouTube Channel for more updates on Helping Hands! Michael & Son – Taking it to the Streets! It was a busy week for the community focused team members at Michael & Son! Check out two these two great events! Team members from Michael & Son Services headed to the James River bike trail and gave it a make over! The team picked up ten bags of trash, helping to keep one of our national treasures looking its best. Check out the pics! The community out reach didn’t end there; our Baltimore team was out in full force helping out a great cause. Our team members joined together with local volunteers to make over 100 sandwiches for various organizations and churches to be distributed to those in need! Check out the pics! Be sure to check in with us weekly for more great community coverage and events! Also like us on Facebook, follow us on Twitter and subscribe to our YouTube page! Saturday, April 1st Ben’s Run – Want to get in shape while supporting a worthy cause? Dust off your running shoes and join us for the Ben’s Run to benefit children with blood disorders. Visit Ben’s Run’s website for more information. Be sure to like us on Facebook and follow us on Twitter for more information on these and upcoming events. We hope to see you out there! This week on Helping Hands we meet Ben Schust and Betty Parker, two remarkable people with touching stories. If someone asked you what a SCN2A gene mutation is, you might reply with a blank stare. You wouldn’t be alone; the disorder continues to baffle researchers and medical professionals around the world. SCN2A gene mutations disrupt the brains regulation of the neuronal sodium channels. This disruption leads to epilepsy, autism, intellectual disabilities and developmental delays. The condition is rare and only effects a few thousand children in the US. We at the Michael & Son Cares Program first came into contact with the disorder back in 2014 when we received a call from a family in Fredrick, Maryland who were in need of a new HVAC system. The Moore family’s twins, 1 year old Nico and Bebo, both suffered from the illnesses. Working with the Moore family gave us insight into not only the day to day difficulties of caring for a child with a rare disease but also the struggles faced by the family to provide their children with proper care. Because they face so many challenges, the families of children with the SCN2A disorder stick together. Through the network FamiliesSCN2A, we were contacted by another family whose child suffered from the gene disorder. Like the Moore’s, the Schust family’s 5 year old son, Ben, carried the mutation and they too were in need of a new HVAC system. Betty Parker had longed struggled with financial difficulties and when she was diagnosed with a rare form of bone cancer, Betty thought things could not get any worse. One cold fall morning as Betty was going about her normal, daily routine, she found there was no water coming out of her faucets. After a visit from a plumber, Betty learned her well pump had gone bad and the cost to repair it was more than she could afford. After months of living with no running water, Betty had lost all hope; until she discovered The Michael & Son Cares Program. Want to find out what happened next? Click here to watch Helping Hands Episode 2. 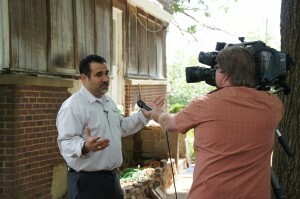 You can watch new Helping Hands episodes Saturdays at 7:00pm on NBC4. Also, check out the schedule below for upcoming air dates. Don’t forget to like us on Facebook, follow us on Twitter and subscribe to our YouTube channel to get updates on upcoming shows and watch full episodes of Helping Hands. While nearly all businesses, small and large, make some sort of contributions to charitable organizations, Michael & Son prefers to be more hands on. Being able to meet the families, see their homes and hear their stories makes for a very rewarding experience. While Michael & Son makes many contributions to charitable organizations, the one on one experience of the Cares Program has proven to be the most rewarding. The smiles on the faces of our Cares Recipientsare far more valuable than any award or citation we could receive. The popularity of the TV show “Helping Hands”, coupled with the harsh economic climate, has applications pouring in every week. “That moment was one of the most uplifting experiences of my life; ever since then I’ve been chasing that feeling”. Basim knew he could not leave the family without power and heat but he also knew Michael & Son (at the time) was in no position to be working pro-bono. Basim decided to seek advice from the one man he could always turn to for advice, his late father, Mike. After explaining the situation to his father, he received the advice that he had been waiting to hear. “There is no question about it, make sure the family has heat and power before you leave tonight. It’s our obligation to give back to the community, where would we be without them?” said Basim’s father. Following the phone call, Basim would proceed to work through the night repairing the family’s electrical problem. “When I flipped the switch and the heat kicked on, the faces of the children lit up with joy and their mother began to cry” said Mansour. “That moment was one of the most uplifting experiences of my life; ever since then I’ve been chasing that feeling”. At Michael & Son, service goes beyond turning a wrench or snaking a drain. It means being woven into the fabric of the community and making a difference every chance we get. We hope that through the work we do, others will be inspired to reach out to those in need. If you or someone you know is in need of help, please contact us by following the Helping Hands link on the Michael & Son homepage. Also, like us on Facebook, follow us on Twitter and subscribe to our YouTube page and find out about special events, great savings and much more! Her daughter, Savannah, was born with a rare gene mutation that caused her to have heart failure as well. The cold temperature in her home was aggravating her condition and they were in desperate need of help. When I spoke with Cari and we talked about Savannah’s condition, I immediately thought of Amanda. It gave the request even more of a sense of urgency and I called Michael & Son CEO, Basim Mansour, who was traveling but gave the green light to have the work done immediately. Within just two days of contacting Michael & Son Services, we were at the Browne’s home installing a brand new HVAC system at no cost. Check out the news story for more details about the job. Also, stay tuned to our Facebook page for information on the new season of Helping Hands starting January 21st! For many of people, sleep is hard to come by; whether it’s because of our jobs or families, sleep can sometimes be elusive. For others, sleep is a curse that hangs over our heads morning, day and night. Narcolepsy is a disease that affects one in every 2,000 Americans and occurs when the brain is unable to regulate cycles of sleep and being awake. This results in excessive daytime sleepiness and intermittent, uncontrollable episodes of falling asleep anywhere and anytime. Patty Kinder is a life-long resident of Virginia and over the last 20 years, Patty has undergone a great deal of hardship. When Patty was about 20 years old, she began having problems with maintaining her energy level and found herself needing to nap more and more during the day. Over the years, her symptoms have worsened and her ability to regulate her wake and sleep periods has gone progressively downhill. Because of the condition, Patty was barely able to keep her job as a licensed veterinarian technician. It became harder and harder to stay awake at work. Many times during her 15-minute drive to or from work, she would have to pull over to the side of the road to nap – sometimes taking as many as three naps on the way. She slept upright in a chair for more than four years just so she wouldn’t fall into a deep sleep and not wake when the alarm went off. When her house flooded, there was no money or energy for repairs. Patty had no choice but to pull the carpet up and live with bare concrete floors. Patty’s house fell into disrepair. When she was awake, she would try to do things but since she couldn’t regulate the amount of time she would be awake, she would start a project and leave it partially done. This happened over and over. Sleep overtook her life. Even during her waking periods, her thinking was foggy and her energy level was very low. Simple everyday tasks became a huge struggle. More than four years ago and after the flood, the HVAC in her house stopped working. Patty could not afford to replace it so she took no action. When the cold weather came, Patty slept in a chair, surrounded by electric heaters. Due to her narcolepsy, there were times when she slept for three days in a row. Sleep and its unpredictability overcame her life. For Patty, it seemed there was no way out of her situation and she would simply have to suffer through it. To make matters worse, about a year and a half ago Patty felt a lump in her breast. It took her weeks to see a doctor. She missed several appointments because of her inability to stay awake. She since has undergone a mastectomy, chemotherapy and is now enduring weeks of radiation for a cancer she hopes she can beat. Because she is not able to work right now, she has no income and is applying for assistance. She hopes to start receiving disability before her funds completely run out. Recently, Patty found some hope and some help in the form of a local nonprofit called DeShong’s Gift Back and the Michael & Son Helping Hands program. DeShong’s Gift Back is the vision of Sterling residents Jane and Vini Short. Their nonprofit grows vegetables and gives them to food pantries; searches for funding; and forms groups of volunteers to help to repair homes for those in need like Patty. They are helping Patty to get her life back. Recently, Patty found some hope and some help in the form of a local nonprofit called DeShong’s Gift Back and the Michael & Son Helping Hands program. DeShong’s Gift Back is the vision of Sterling residents Jane and Vini Short. Their nonprofit grows vegetables and gives them to food pantries; searches for funding; and forms groups of volunteers to help to repair homes for those in need like Patty. They are helping Patty to get her life back and are in the process of continuing the improvements. If you would like to make a difference in the life of Patty or others like her, go to www.DeShongsGiftBack.org or email them at DeShongsGiftBack@gmail.com. It’s been said time and time again, the goal of the Michael & Son Cares Program is not only to help families with essential home repairs they can’t afford, but to also inspire other businesses to do the same. To date, The Michael & Son Cares Program can proudly say our goals are being met. The type of support we receive from businesses in the community range from services that are beyond the scope of our expertise, products, and sometimes financial contributions. For those of you who are not familiar with the Michael & Son Cares Program or the Helping Hands TV show that documents our work, here is a quick run down of how it works: Families who are in need of assistance with home repairs because of financial issues due to illness or disability send us an application detailing their situations. Every month we select a family and not only provide the services free of charge but also a special surprise for the family. Charlie Crohare suffers from an extremely rare brain disorder similar to Miller Dieker syndrome. 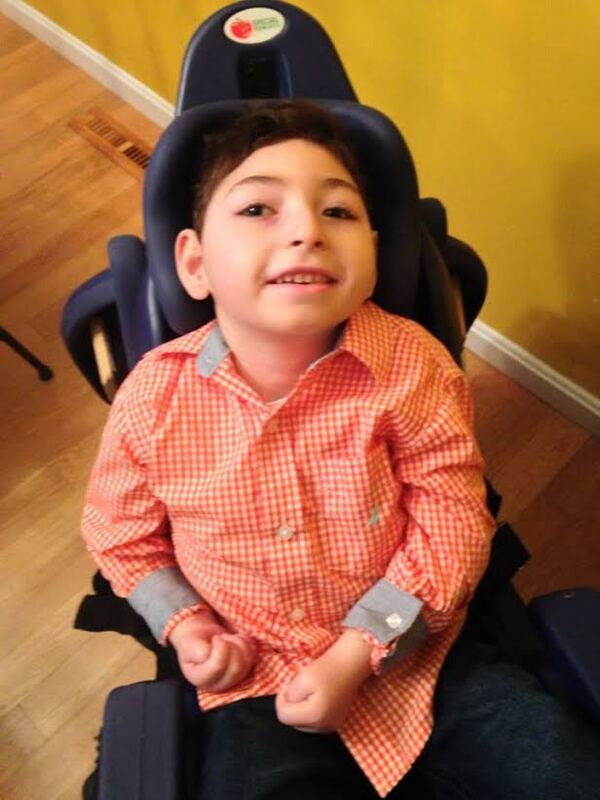 At 6 years old Charlie is a quadriplegic and has the brain development of a 2 year old. He suffers from daily seizures that can last up to 45 excruciating minutes and has been air lifted from his home, to the hospital dozens of times. Because of his condition, when he is not confined to his medical crib or wheelchair, Charlie can safely relax in bean bag chairs to play with his toys, games and watch movies. When we heard about Charlie’s love for bean bags, we reached out to local custom bean bag maker, Ahh! Bean Bags, who was more than happy to make Charlie an oversized, custom bean bag. Monet and Greg Caldwell reached out to the Care’s Program when their home heating system broke down during one of the coldest winters on record. Their youngest of two children, Skyler, had just been born 10 weeks earlier with a thyroid cyst that required surgery. Because the cyst was located in her throat and any infection could cause a complete blockage of her tiny airway, the Caldwell’s could not risk bringing Skyler home to a cold home following the surgery. After resolving their heating issues, the Cares Program granted the Caldwell’s wish for a couples night out and a family day out. 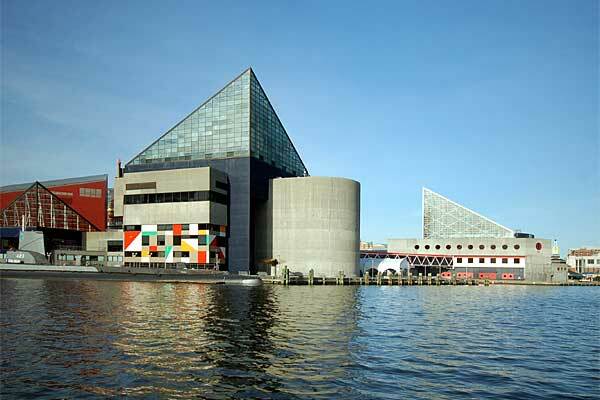 After sending Monet and Greg to a night out in Old Town, the Baltimore Aquarium invited the family for an all access afternoon, including a dolphin show, feeding demonstrations and a meet and greet with the turtles. As a teenager, Brandon Donaghy was involved in a near fatal car accident that left him in a coma for nearly a month. The subsequent brain injuries that resulted from the coma left Brandon with memory and anxiety issues that made it impossible for him to hold a job. When Brandon woke up one cold morning to a broken heating system and no way to pay for a replacement, he began to panic. He sent his four children to stay with his grandmother while he searched for a solution. 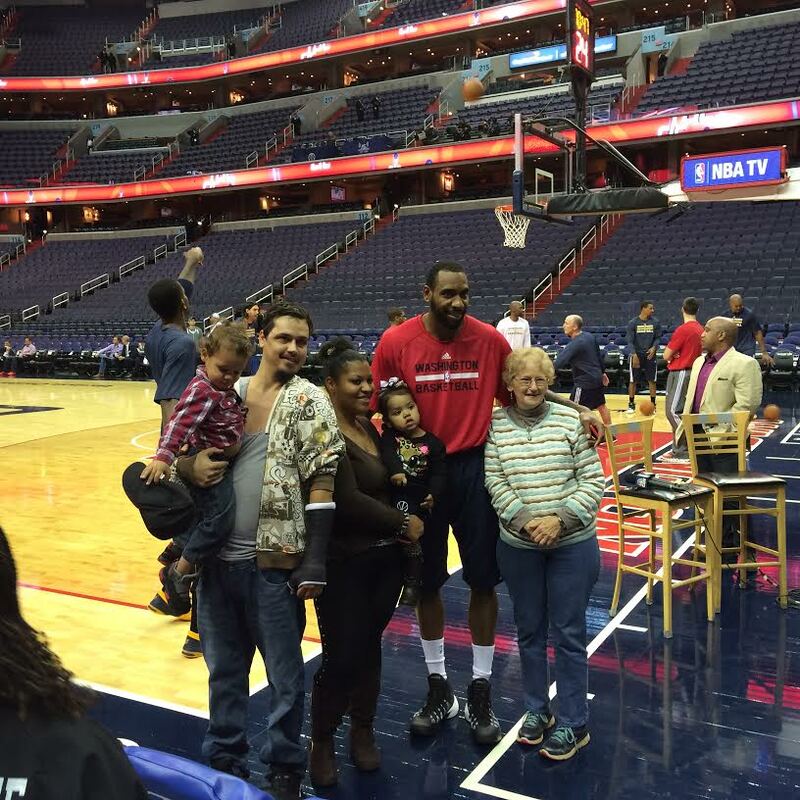 The Michael & Son Cares Program stepped in and along with restoring heat to the home, our friends at the Verizon Center gave the Donaghy family a night they will never forget. Along with a fully catered suite, the Donaghy’s sat court side during the Wizards warm up, met players and received bags of autographed merchandise. One common theme throughout the stories above and many others is HVAC (heating and cooling) systems needing to be replaced. Most homeowners know that replacing them can cost thousands and repairs are usually band aids. Carrier is one of the worlds most well known and trusted names when it comes to HVAC, both residential and commercial. As top sponsor of the Michael & Son Cares Program, they are also one of the most generous. Today, over a dozen families have heat and A/C in their homes thanks to the community conscious people at Carrier. You can see these stories and many more by visiting our website for a complete collection of past episodes of Helping Hands. Also, be sure to follow us on Facebook and Twitter to find out about the upcoming season of Helping Hands, special events and much more!